1. Each column, row and 3x3 subgrid must have the numbers 1 to 9. 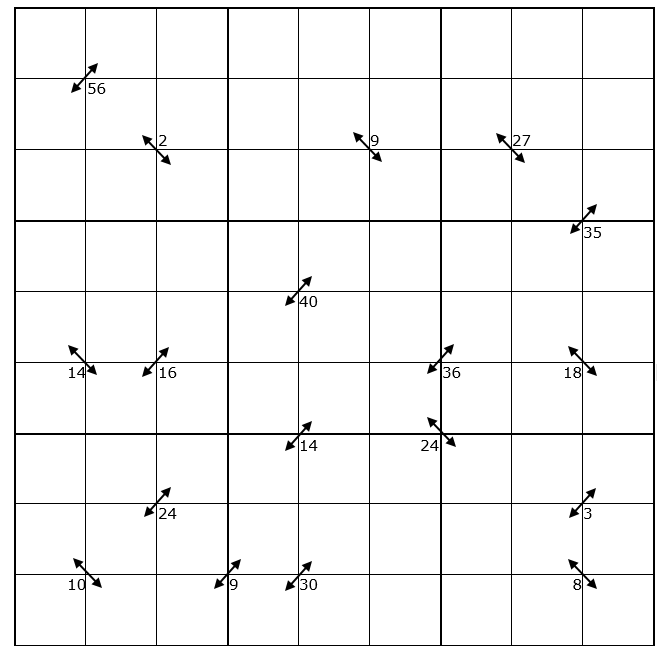 The puzzle can be solved with the help of clue-numbers which are small numbers written next to the arrows on the intersections between cells. Each clue-number is the product of the two digits in the two cells that are diagonally adjacent to each other. The position of each pair of diagonally adjacent squares is indicated by the arrows. For example, 24 in the bottom left box means that the possible pairs of numbers for the cells indicated by the arrow are either 3 and 8, 8 and 3, 4 and 6, or 6 and 4. Indices. Modular arithmetic. Interactivities. Working systematically. Visualising. Games. Factors and multiples. Networks/Graph Theory. PrimaryGames-Strategy. Mathematical reasoning & proof.